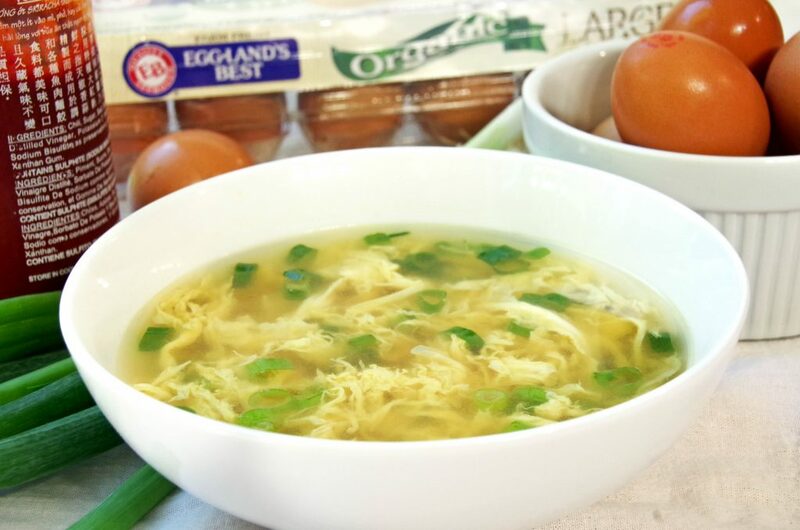 This easy egg drop soup recipe has been sponsored by Eggland’s Best Eggs but all opinions expressed here are my own. I have a serious weak spot when it comes to Chinese food. I have my local delivery place on speed dial for those days when I am in a hurry or just really craving fried rice. Sometimes I make it from scratch at home like this easy egg drop soup recipe or my Teriyaki Glazed Pork Belly Recipe. 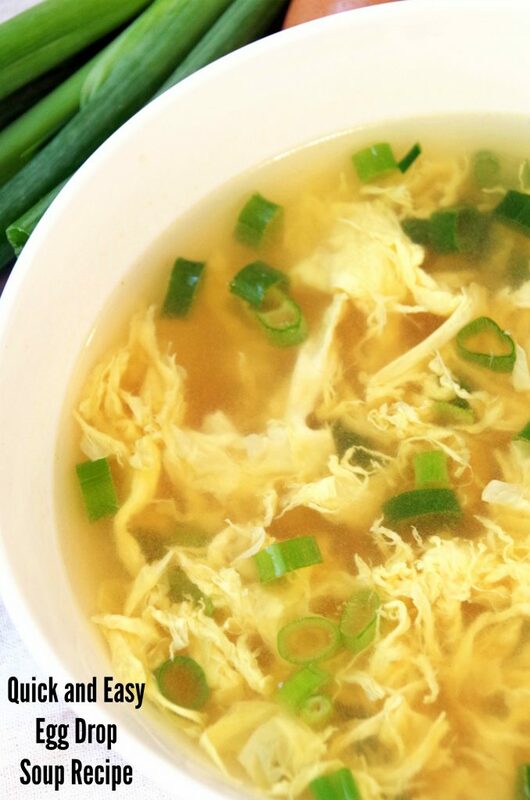 This homemade egg drop soup takes about 15 minutes to make. Most of that time is spent waiting for your stock to come to a boil. Once it is simmering, just stir in a few beaten Eggland’s Best Eggs and green onions and you have a delicious weeknight meal with very little work! I am picky about my eggs. 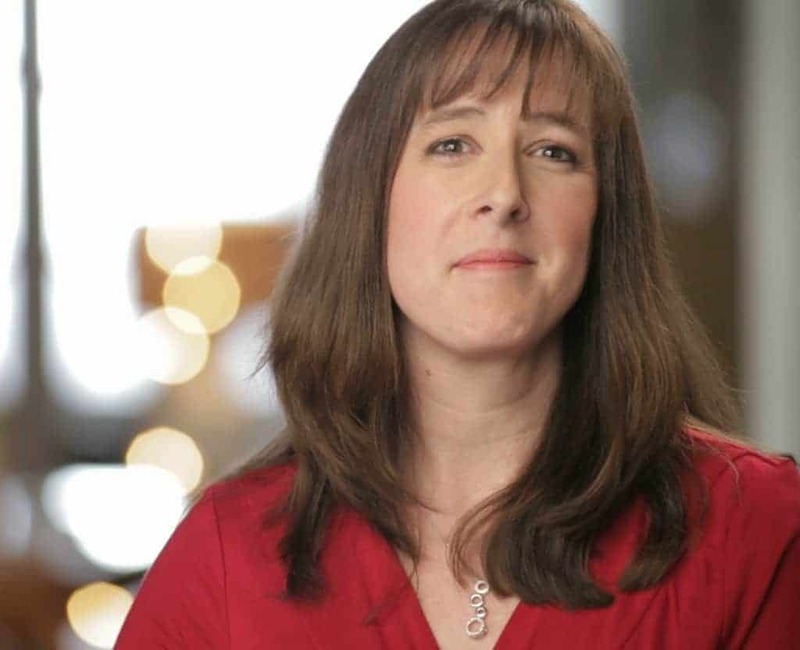 I look for keywords like organic or free range whenever possible. 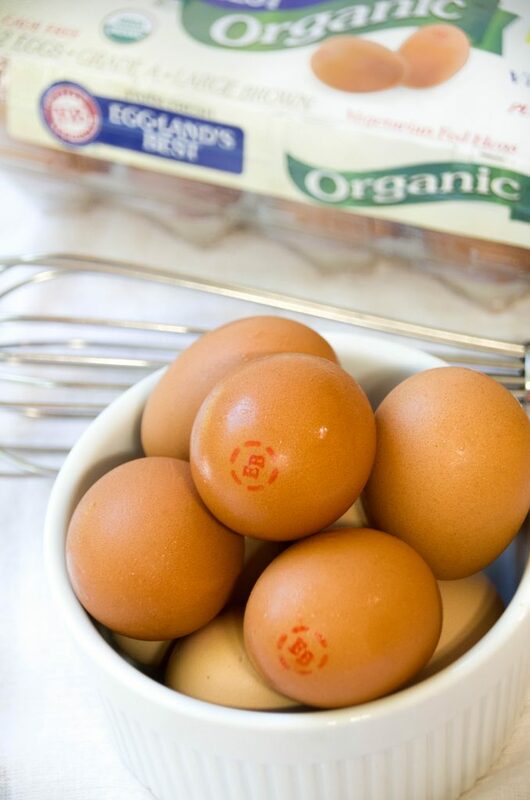 Eggland’s Best organic eggs are easy to find in my local grocery store, which I really love. They are an excellent source of vitamins D, B12, E, B5 and Riboflavin. EB eggs also have six times more vitamin D, more than double the omega-3, 10 times more vitamin E and 25 percent less saturated fat than ordinary eggs. Eggs are a great way to add protein to your diet while still reducing your meat consumption. Eggland’s Best wants to send their EB Better Egg Truck to your city! From now until December 22, EB is calling on fans across the U.S. to enter their city to win a visit from the EB Better Egg Truck. Fans can enter once per day, and share on Facebook or Twitter for an additional bonus entry. One lucky fan will also be selected at random from the winning city to receive an exclusive Better Brunch from the EB Better Egg Food Truck for them and their closest friends. Go VOTE FOR YOUR CITY and give them a try! So, I am not kidding when I say this soup is quick and easy. You need some stock, vegetable or chicken will work, although I used chicken. You add a few seasonings and bring it to a simmer. Then, just whisk in some beaten eggs and toss in green onions and sriracha. If you don’t like the heat, you can leave out the sriracha. From start to finish this was finished in less than 15 minutes and mostly that was just waiting for the stock to boil. Simple ingredients and very little work. That is the type of recipe I like! Drizzle the beaten eggs into the broth, stirring IN ONE DIRECTION while you pour them in. 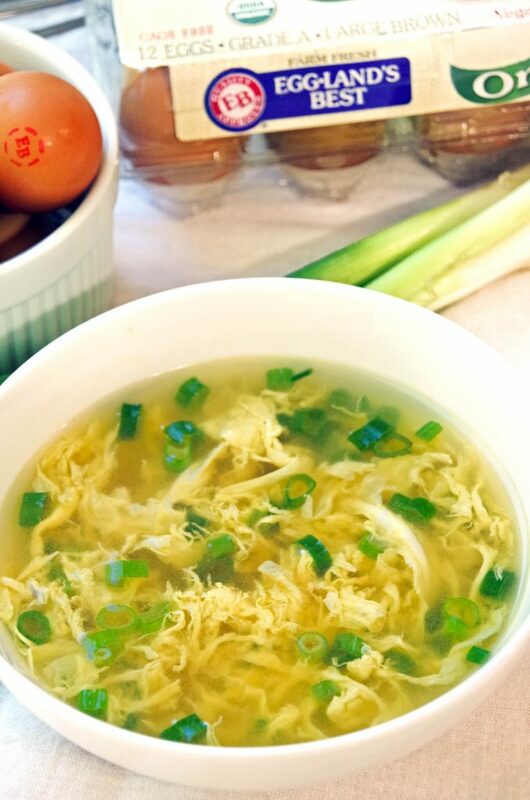 Like this Easy Egg Drop Soup Recipe? Pin it for later! Get more Egg Recipes! Check out my review of the Fresh Egg Cookbook! Enter to Eggland’s Best Giveaway! Eggland’s Best will give one of my readers a $25 Virtual Visa Gift Card (good ONLY on online purchases!) and a coupon for FREE Eggland’s Best Eggs. Just follow the directions in the form below to enter to win! I love potato salad and egg salad. I love making puddings with the freshest milk, the freshest eggs and really good vanilla and freshly grated nutmeg. That's with Eggland's Best Eggs. I love eggs in multiple ways. I guess my go-to way is scrambled eggs. My favorite eggs are my Bacon and cheese omelets. So delicious! My favorite recipe with eggs is french toast. I just love scrambled eggs for anytime of the day to eat. I love chilaquiles with fried eggs on top! My fav egg recipe is quiche. My favorite recipe to make with eggs is egg salad sandwiches! I could literally eat them for every meal! My favorite is Tamagoyaki (Japanese Omelette). I like a Denver omelet. I love making egg salad. My favorite egg recipe is bacon and cheddar quiche. I love deviled eggs with spicy mustard. I like making breakfast burritos with them. Thanks for the chance to win! My favorite egg recipe is a tomato, onion and broccoli omelet! My favorite recipe with eggs is a ham and cheese omelette. My favorite egg recipe is Quiche Florentine! I like to make deviled eggs with bacon. I love to scramble eggs and add it on a bacon biscuit.